Usually driving down a strip in Central New York in the inner or outer suburbs, and along some of the old entrance routes to Syracuse, one drives by rows of boxes. Closest to the city center are a few decorated Art Deco boxes and some small post-World War II brick retail and service stores simple and functional in their design. On older streets (like James Street in Syracuse), are more delicate, often see-through modernist boxes, where they replaced mansions torn down in the 1960s and 70s., and to these we can add some fast food outlets that still draw on post-war modernism for inspiration. Lastly, and so common now, are the rows of big bulky boxes with nothing to look at all to catch the eye - so uninteresting in their design inside or out - that their bigness and boxiness has given them their name of "big box stores". Well, I had a pleasant break from this the other day heading to Camillus, when I drove by in quick succession two striking buildings that seem to have escaped from the box - and delight in offering alternate geometry. The sanctuary of St. Luke's Episcopal Church at 5402 West Genesee St., designed by Crenshaw & Folley and built in 1957, has a tall thin profile with steeply slanting sides, like someone cut it a like a piece of pie from a larger building. The architecture seemed perfectly appropriate for the adjacent sign proclaiming "Allealuia, Christ is Risen," for indeed this building with its tall cross inscribed on the window wall facing the street seems to have arisen itself, sprung up for Easter beside the busy road. Inside, the narrow sanctuary space soars, but the wood lined space is warmly intimate. The is one of the most expressive modern religious buildings in the Syracuse area. And for those who know my interest in plastics in architecture, there is the added fact that St. Luke's interior wood is Rilco laminated wood from the Weyerhaeuser Co., bonded with "structural glues stronger than wood itself" (plastics). Just down the road is the Wilcox Octagon House of Camillus, built in 1956, and one of the best preserved buildings of this type in Central New York. In my mind the two buildings seemed instantly related, because the octagon, since Early Christian times, carried the meaning of resurrection, too. In Early Christian baptistry design seven sides stood for the days of the week, and the eight side represented the Day of Resurrection and Eternal Life, when the soul was reborn through Christian baptism. Now, the builder's of the Octagon House almost certainly did not have this in mind - they were following the building precepts of Orson Squire Fowler in his influential book A Home for All; or, the gravel Wall and Octagon Mode of Building of 1853, in which he made the case for the octagon as the healthiest house form. 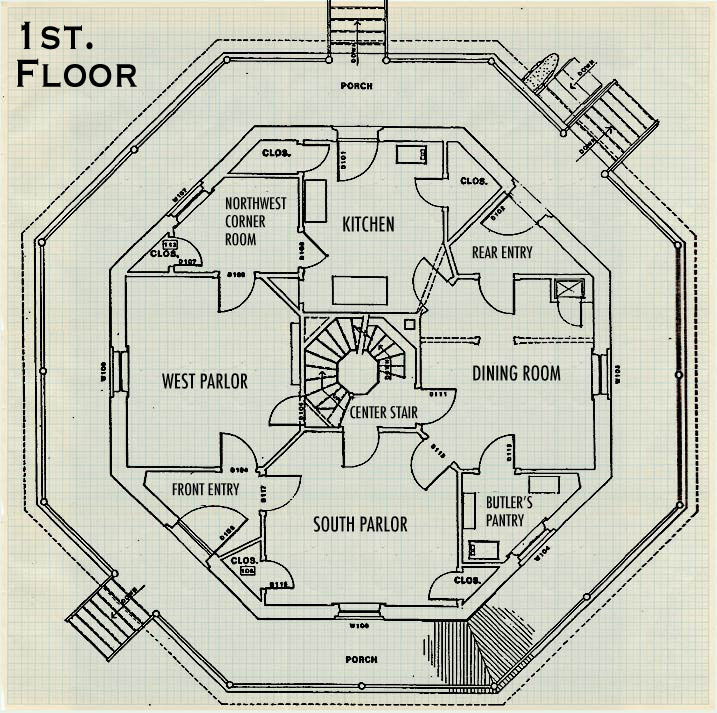 Fowler promoted the octagon house as cheaper to build, and with more living space and natural light. He maintained that because of the geometry it was easier to heat, and that it remained cooler in the summer. Fowler believed that a circle is the most efficient shape, but would be difficult to build and awkward to furnish, so an octagon was a sensible approximation. The octagon house is remarkable, however, not just for its design, but because it referred to an entire philosophy of living quite different from the societal norm represented by the dominant Greek Revival and Italianate houses of the period. To a certain extent, builders of the octagon houses accepted a less formal domestic arrangement, and this often mirrored their other social and political views. Another octagon house is the Henry E. Pierce house on Bear Street, near Washington Square, in Syracuse. The best residential streets include a variety of houses, and these houses consist of a variety of parts. The balance of consistency and variety is what makes a walk down any block visually interesting, and makes one want to do it again and again. There should always be - even in the most familiar settings - something new to see, or some relationship of parts, or revelation in changing light or foliage - that has never been seen before, or at least not seen for a long time. We need - even crave - visual stimulation even more than we know. Dullness breed dullness. 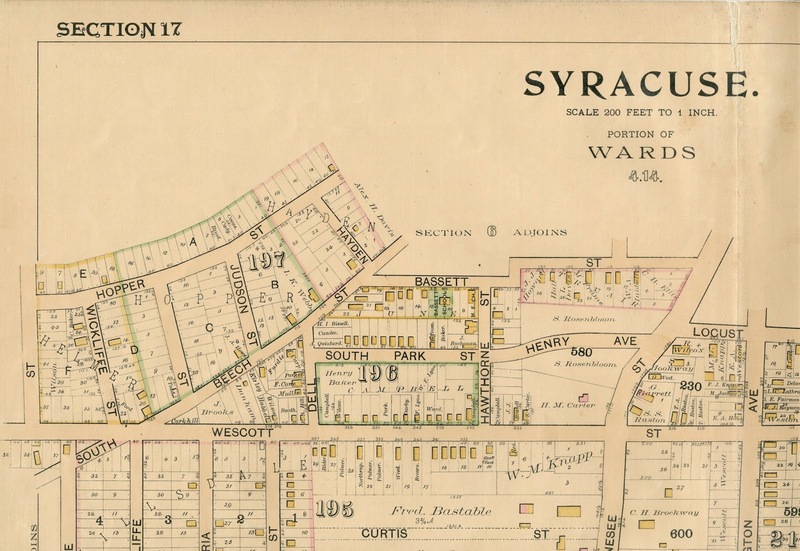 This Sunday I'll begin my spring walking tours in Syracuse's Westcott neighborhood (click here for the schedule). In the grand scheme of things, these few dozen blocks are really pretty much all of a piece. Built mostly between 1880 and 1930, they comprise a fairly typical American "streetcar suburb" - an early type of segregated (by function) residential development. Yes, despite the commonality of it all - there is ceaseless variety street to street, from house to house, and upon each facade and in each yard and on each porch. Syracuse, NY. Westcott and South Beech area mapped in 1892. This the area of Sunday's (April 27th) walk. Sunday, we'll stroll down the 400 and 300 blocks of Westcott Street between Dell and East Genesee. The first block - until Hawthorne - contains some of the oldest houses in the neighborhood. Most already show up on our first map of the area published in 1892 (above). These houses are mostly narrow wood frame late Victorian structures, simple in form and easy to build, but often more ornate in their applied decoration - some of which can still be found where house hasn't been stripped and vinylized. Most decorative in these types of houses were the porches, which were also essential functional features in an era when street crime here was not an issue, and air conditioning was unknown. I like to anthropomorphize houses. 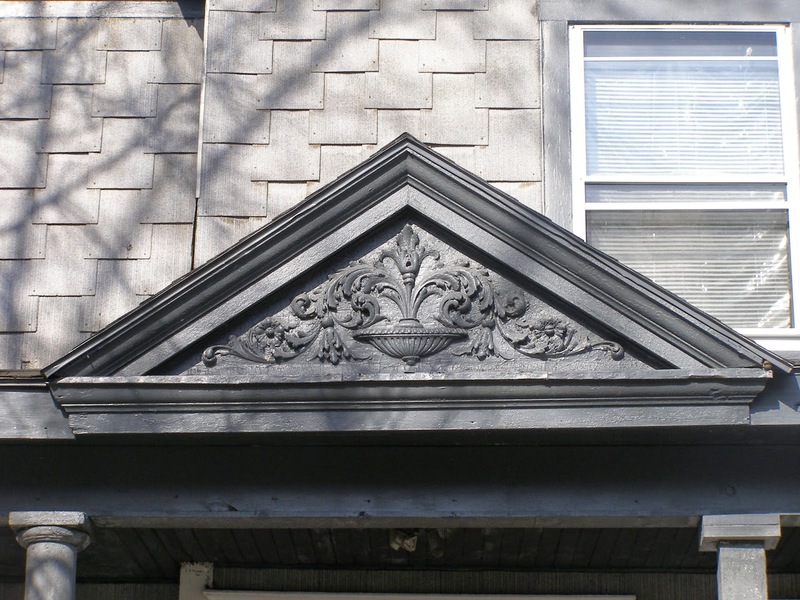 If the windows are the eyes, gables the brow, and the roof the hair, then a house's front porch is its mouth - and smile. Some porches/smiles are more radiant and open than others. Some have recently had a cleaning and maybe some orthodontia, others present crooked smiles of quirky beauty, and distinctive personality, and suggesting deep secrets, too (yes, twenty years ago, my first year in the neighborhood, body parts were found under a porch on South Beech - but that is not what I'm talking about). Sadly, not a few porches look like they've had their teeth kicked out. The New Urbanism movement touts the value of porches - and has championed their construction in planned and suburban developments as a way for residents to show themselves to their neighbors and create community. In the Westcott neighborhood the Old Urbanism works fine - though sometimes it needs a tune-up. 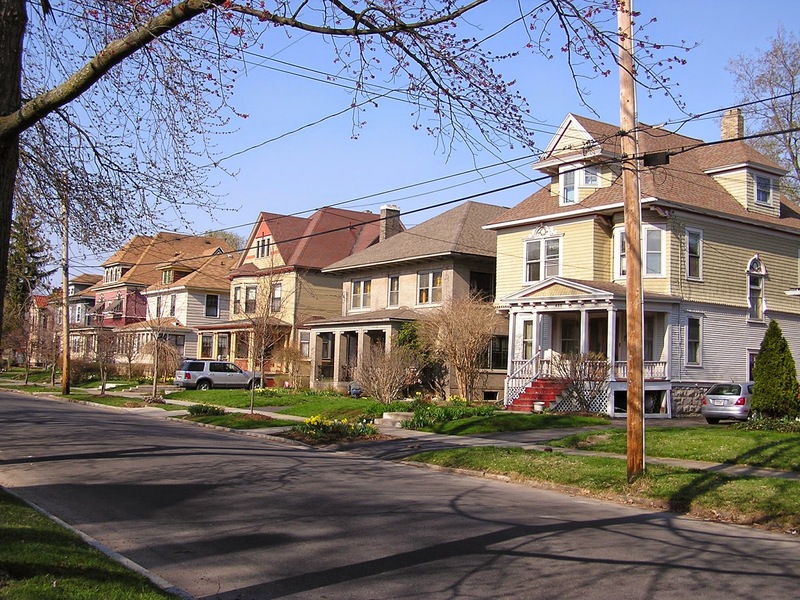 I'd like to see all of Syracuse devote itself to porches - fixing them up, spending time on them, and letting houses reconnect with their streets through these essential transitional spaces. The porch is public and private - the best model of an urban life. What kind of porch do you like? Join me on this year's Westcott Neighborhood architecture and history walking tours, as we explore the development of the Westcott neighborhood, its architecture and its distinctive “Streetcar Suburb” characteristics. Most of the neighborhood was planned and built between 1870 and 1930, and in its blocks are scores of examples of fine residential architecture in many styles: Queen Anne, Colonial Revival, Tudor Revival, and a variety of examples of the Arts & Crafts Movement. I'll discuss these and other trends in urban design, and many features of house architecture and city streets we often take for granted. Whether you are a long time resident of the Westcott Neighborhood or a first time visitor, you’ll see and learn something new on these community-sponsored walks. Startpoint: Westcott Community Center, Westcott St. & Euclid Ave.
Sam Gruber is an internationally known art and architectural historian, and cultural heritage consultant, who is a long time resident of the Westcott Neighborhood. He served for many years on the board of Westcott Neighborhood Association and the Preservation Association of Central New York, of which he served as president, and formerly led the Westcott Neighborhood Historic House Tours. Sam teaches part-time at Syracuse University and writes the blog My Central New York.